@Zheng-Han Thanks! I have cron set to run the script every 15 minutes. It creates 7 differently named access points all at the same time. Total execution time of the script is about 3.4 seconds. Here's a screenshot from an Android phone showing nearby WiFi access points. 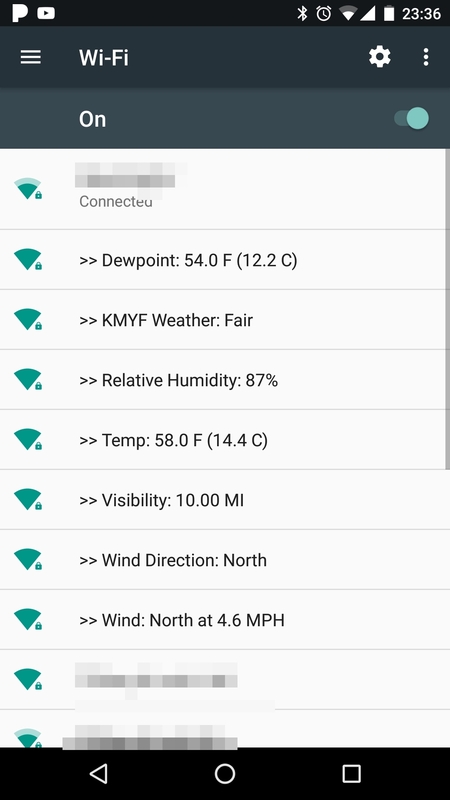 This script uses PHP, Curl, and Bash to look up current weather conditions and create 7 wifi access points with the data. It's designed to work with weather.gov's XML feeds. Modification to make it work with other data sources should not be too difficult. The command executed successfully, but after reboot the error still shows up. [   10.020000] jffs2: notice: (338) jffs2_build_xattr_subsystem: complete building xattr subsystem, 0 of xdatum (0 unchecked, 0 orphan) and 0 of xref (0 dead, 0 orphan) found. [   10.110000] jffs2: notice: (334) jffs2_build_xattr_subsystem: complete building xattr subsystem, 0 of xdatum (0 unchecked, 0 orphan) and 0 of xref (0 dead, 0 orphan) found. [   13.720000] ntfs: driver 2.1.31 [Flags: R/O MODULE]. Hi @Boken-Lin.. I tried that an received the error "write error: No such device". I tried the same command in other USB related areas and didn't really make any progress. I don't know if it will help any, but here's 1,117 lines copied from my last terminal session. Taking shots in the dark for the most part.. Here's the output of a few other commands..